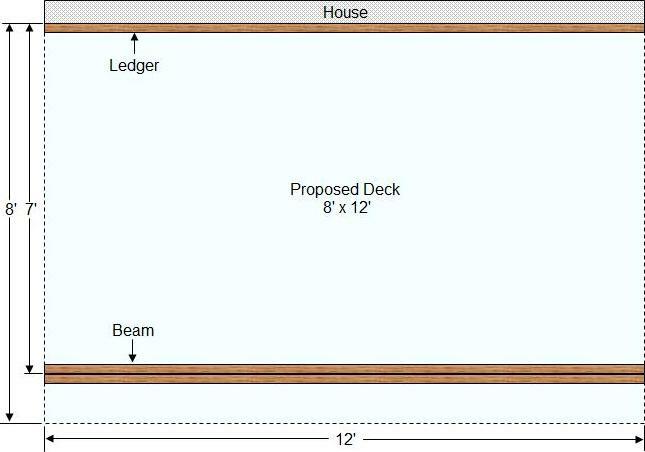 If you are planning on building a raised deck, as shown in Figure 1, it is important to determine the quantity, positioning and size of the deck support columns that will support the load of the deck, the dead load, and the load which is created by the things that will go on the deck, including you and your guests which is the live load. 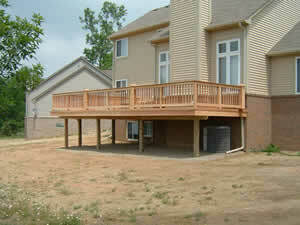 Note: Many municipalities require a building permit in order to construct a raised deck. Although many homeowners are hesitant about working on these calculations, they are important. You want your deck to be safe and last for many years, yet you don’t want to add expensive deck support columns and footings that are not necessary. This article will guide you through the process of calculating the deck load and the positioning of the deck support columns for your new deck. The calculations used are based on a deck that is rectangular in shape. The calculations can be used for any shape deck, just adjust them for the geometric shapes that are involved. Note 1: These calculations are based on the footing resting on clay soil. If your soil is organic, you will need to either replace the organic material with gravel or preferably dig down to a point where you reach clay soil. The more moisture in the soil, the less of a load it will carry. You can design your deck for a soil load with a maximum of 1,250 psf (pounds per square foot) as it is unlikely that any clay soil would have less than 1,250 psf capacity, or you can contract with a soil engineer to obtain the exact psf rating of your soil and your local municipal building department may be able to provide you with some soil load guidelines for your area. Note 2: We will use a dead load, the weight of the decking material, as 10 psf, a common dead load number for a deck and we will use 40 psf as the live load creating a total load of 50 psf. If you are planning to install a spa or hot-tub on your deck you will have to increase the live load calculation dramatically. Most hot-tub and spa manufacturers will be able to advise you on the live load design criteria for their products. We will use a deck size of 8 feet x 12 feet where the 12 foot section is connected to your home with a ledger board and the floor joists run from the ledger board to a beam that is located 7 feet from the house, we will cantilever the deck 1 foot past the beam, providing a total deck depth of 8 feet, as shown in Figure 2. 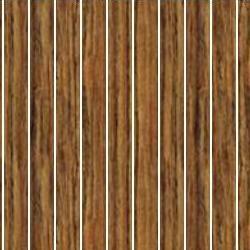 As we have determined that we want a deck that is 8 feet x 12 feet we can calculate the total area of the deck - which is Length x Width = 8 x 12 = 96 sq. ft.
We are using a total combined load, live load and dead load, of 50 psf which means that our deck supports including the ledger, which is attached to the house wall, will have to carry a total load of 96 x 50 = 4,800 pounds. 7 feet (the distance between the ledger and the beam) divided by 2 (half of the load) multiplied by 12 (the length of the deck) multiplied by 50 psf (the load), which equals 2,100 pounds. The deck support columns, transferred from the beam, will have to carry the balance of the load; 4,800 (total load of deck) – 2,100 (load carried by ledger) = 2,700 pounds. We also determined that the maximum load we want to carry on any one deck support column is 1,250 pounds. The calculation of 2,700 ÷ 1,250 comes out at 2.2. You must round up to the next highest number as you cannot have 0.2 of a deck support column. The calculation would indicate that we need 3 deck support columns.